Animal behaviorist and author Alexandra Semyonova1 provides safety guidelines for owners of normal dogs and dangerous breeds in two different guides. Each contains 10 rules of thumb. The dog ownership guide for normal dogs covers dog breeds and types that have never been used for aggressive purposes -- the companion breeds. These are breeds and types that do not show up disproportionately in serious and fatal dog attack statistics. The dog ownership guide for dangerous breeds covers dog breeds and types that have been developed and used for war, dogfighting, animal baiting, and/or guarding purposes -- the dangerous breeds. These are breeds and types that are disproportionately represented in serious and fatal dog attack statistics. Did You Know That DogsBite.org Consists of Over 2,200 Web Pages? Learn more about animal behaviorist and author Alexandra Semyonova by visiting her website, Nonlinear Dogs. 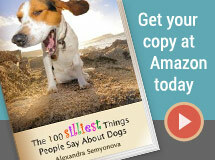 Excerpts and several chapters of her book, The 100 Silliest Things People Say About Dogs, are located on her website.